The Inspirational Women Engineers competition celebrating women in the field was held at the Department of Engineering. The winners were announced at an event during a lunchtime champagne reception. The competition was run by the Athena Swan team in order to raise awareness of the many amazing women engineers, past and present, and to help inspire others to pursue study and careers in engineering. Nearly all the engineering portraits that hang around the Department of Engineering are of male engineers; displaying the winning entries will help to redress the balance and counteract the ‘stereotype threat’ effect for the many women now studying and working in the department. The competition attracted 60 nominations of women from all over the world and all engineering disciplines – from over 2000 years ago up to the very current achievements of Department of Engineering alumna Ruth Buscombe. Ineligible for nomination were women currently working or studying in the department, as this would have made judging an impossible task. The quality of entries was excellent, and with so many interesting stories the judging panel found their task very difficult. All the entries are now available online as a booklet. After some discussion, first prize was awarded to Vere Whittome for his nomination of Margaret Hamilton. 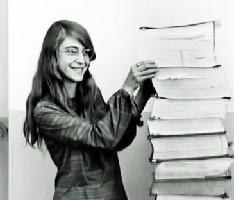 Using one of the first chip-based computers with only 64k of memory, Margaret successfully wrote the code which enabled humans to land on the moon. Through her scientific papers and the work of the company she later founded she also made important contributions to ideas about fault-tolerance and reliability. Vere, an undergraduate engineer in the department, was presented with his prize of an iPad by Professor Dame Ann Dowling, who also presented gift tokens for chocolate to the twenty runners-up. Dame Ann, former Head of Department and Professor in the Energy, Fluid Mechanics and Turbomachinery division, now serves as President of the Royal Academy of Engineering. The winning and shortlisted entries have been designed and printed in-house and are on display in the Engineering Library. After the initial display, the posters will be framed and shown around the Department’s various buildings. The 60 total entries will be bound together in a booklet which will be available in the library. There is already interest in running the competition again, and the hope is this will become an annual event. To complement the competition posters we are currently seeking profiles of women engineers (both staff and students) from within the Department. We are aiming to publish these profiles to coincide with National Women in Engineering Day on 23 June 2016 to inspire potential women applicants by showing that women are forging successful paths at CUED in all branches of engineering and at every level. This article was originally published by the Communications Office on the Department's news pages.